Product and ordering information for Bulb Pipettes – Class A, USP, Certified. Available in all ISO sizes from 5mL to 100mL. Made of AR-GLAS®. Supplied with a batch number and an accompanying USP batch certificate. 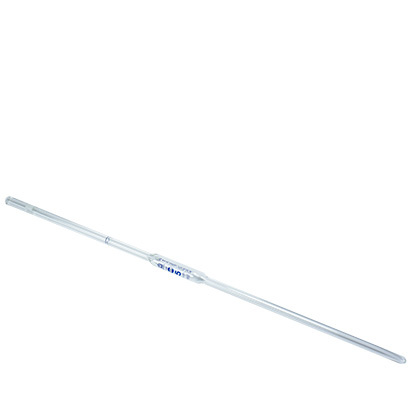 Class A, USP, certified single-volume bulb pipette. High contrast blue enamel print represents the optimum combination of resistance and readability. Available in all ISO sizes from 0.5mL to 100mL. Made of AR-GLAS®. The optimized flow of geometry in the tip ensures reliable liquid dispensing from the pipette. The mechanical resilience of the tip and its fire-polished edges ensures a long service life. All BLAUBRAND® USP bulb pipettes are supplied with a batch number and an accompanying USP batch certificate in the original packaging. Companies producing pharmaceutical products for the US market are supervised by US authorities, e.g. the FDA (Food and Drug Administration), and have to meet the requirements of the USP (United States Pharmacopeia). The current USP prescribes in section 31 the use of volumetric instruments with accuracy in accordance to class A of the ASTM standards and list those for volumetric flasks, transfer pipettes and burettes in tables. For graduated pipettes up to and including 10 mL size the error limits are mentioned in the text. BRAND volumetric instruments are manufactured according to the current DIN EN ISO standards. As the construction specifications are differently defined in the DIN EN ISO and ASTM standards, the error limits differ as well. With included USP certificates BRAND confirms for the delivered USP volumetric instruments that the class A error limits according to the USP or, rather, ASTM standards are met. Every glass volumetric measuring instrument is individually calibrated. Computer-controlled systems ensure maximum precision in a fully automated production line. The final step of this Statistical Process Control is random sampling of finished product according to DIN ISO 3951. The quality management system applied at BRAND, which is certified according to DIN EN ISO 9001, is a combination of process monitoring and random checks with an accepted quality level (AQL) of approximately 0.4. The batch certificate confirms that ASTM class A error limits required by USP are met. The certificate records the mean value, the standard deviation of the batch and the date of issue (batch number: year of manufacture/batch). What is Boro 3.3 glass? The abbreviation Boro 3.3 stands for a borosilicate glass type 3.3 as specified in international standard DIN ISO 3585, for applications requiring very good chemical and thermal resistance (including resistance to thermal shock), and high mechanical stability. Typical applications are components for chemical apparatus, round-bottom flasks, and beakers. AR-GLAS® is a type of soda-lime glass with good chemical and physical properties. Soda-lime glass is the most common type (90%) of manufactured glass. It is suitable for products which are usually subjected to short-term chemical exposure, and to limited thermal stress (e.g. pipettes, culture tubes). 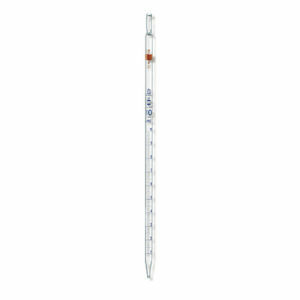 What pipette controllers can be used with the bulb and graduated pipettes? Any of the pipette controllers offered by BrandTech® can be used. Depending on your application, choose the macro™ for manual control or the accu-jet® pro for motorized control. How should I clean my volumetric glassware? What is the advantage to using glass vs. plastic? Glass has very good chemical resistance against water, saline solutions, acids, alkalis and organic solvents, and in this respect surpasses the majority of plastics. It is only attacked by hydrofluoric acid, and - at elevated temperatures - by strong alkalis and concentrated phosphoric acid. Further advantages of glass are its dimensional stability, even at elevated temperatures, and its high transparency. What advantages do amber flasks have? Amber flasks preserve light-sensitive chemical solutions from UV-radiation. BLAUBRAND® amber flasks are made by diffusion of amber stain into the outer surface of clear glass, so the chemical solution only comes into contact with borosilicate glass 3.3 and not with the amber stain. What kind of screening ink is used for printing the volumetric glassware? Blue and white enamel are printed on the outer surface and provide a high contrast and an optimal combination of chemical resistance and legibility for the volumetric glassware. The amber diffusion stain used for the BLAUBRAND® amber flasks diffuses into the glass surface and can only be removed by abrasion or glass corrosion. How are the graduated cylinders calibrated? 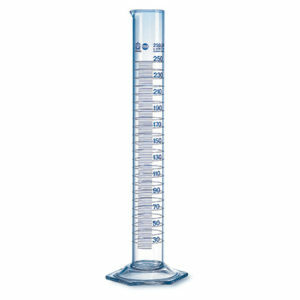 The graduated cylinders are calibrated "To contain" (TC, IN). 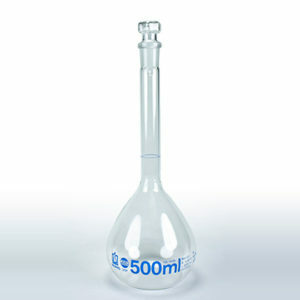 The contained quantity of liquid correspond exactly to the capacity indicated on the instrument. What is a Type 2 graduated pipette? Type 1: Nominal capacity above the tip and the zero point at top; Set the meniscus at zero point and discharge the liquid to lower volume. Type 2: Nominal capacity at the top; Set the meniscus for the volume intended to deliver and discharge the liquid completely. This is the only type that requires just one meniscus reading so it is quicker and easier to use, and is the only type that BrandTech® sells. Type 3: Zero point at top; Set the meniscus at zero point and discharge the liquid partially to one lower volume mark or completely. What is the proper way to use the pipette? Fill pipette to approximately 5mm above selected graduation mark. Remove any liquid remaining on the outside with a tissue. While holding the pipette vertically, set the meniscus. Wipe off any drops of liquid. Align tip at inner surface of inclined vessel. Deliver liquid and, after waiting time, draw the pipette tip upwards along the inner wall. There is a small amount of residual liquid in the tip. Should it be blown out? No. The small amount of residual liquid has been taken into account during calibration ("To deliver" or TD calibration) of the pipette and should not be blown out. Can you explain the waiting time for pipettes? The waiting time begins when the meniscus comes to rest at the lower volume mark or in the tip: During the waiting time residual liquid continues to flow down from the glass wall. Meniscus may need to be set once again after waiting time. How can the meniscus be easily read? The volume of a concave meniscus has to be read at the lowest point of the liquid level. Here the lowest point of the meniscus has to touch the upper edge of the graduation mark. For parallax-free adjustment of the meniscus, the pipette is held upright and the observer's eye must be at the same height as the meniscus. In this position the ring mark will appear as a line. If the background is light, a piece of dark paper held behind the instrument immediately beneath the ring or graduation mark will make the meniscus appear darker and more easily readable. ⚠ WARNING – These products can expose you to chemicals including Lead and Lead Compounds, which are known to the State of California to cause cancer and birth defects or other reproductive harm. Are Your Glass Volumetric Instruments Accurate?